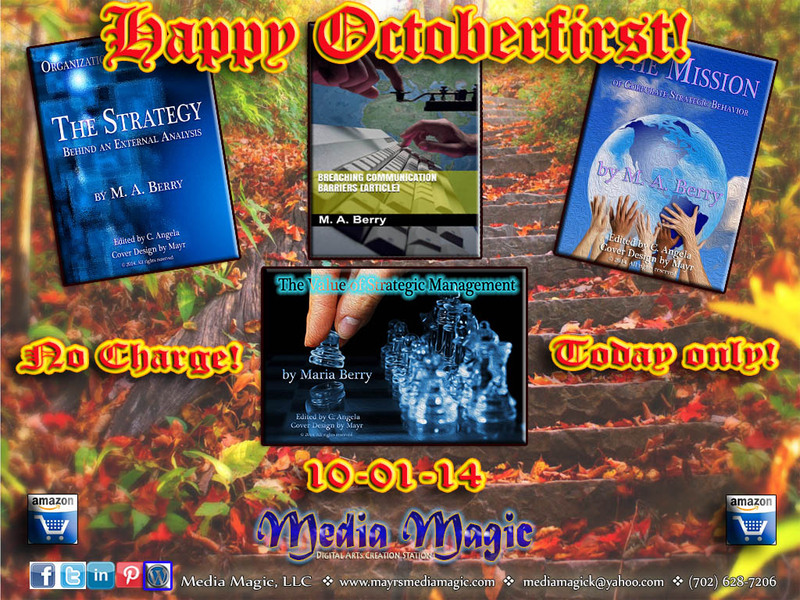 Welcome everyone to the Octoberfirst celebration with Media Magic Digital Publishing! Today only, the following titles are available as complimentary gifts on amazon.com! In this eBook (also available in audiobook format), Mayr’s research work helps the reader understand the value of effective communication. It will take a closer look at why it is an important tool for leaders in organizational management and how it can also help in our personal lives. Mayr also includes examples from her own experiences to help illustrate some of these concepts. Knowing how to engage in active listening and communicate effectively, without criticizing or offending others, are significant components for anyone interested in developing more successful communication skills. This title (available in eBook or audiobook format) provides insights to effective leadership skills and examine strategies that top performers implement to manage an organization more efficiently. It also provides a powerful motivational key; one that will unlock a treasure of innovative ideas by examining how top performers achieve their desired outcomes more efficiently. Mayr examines such components like (a) the strategic management process, (b) the systems implemented to monitor performance measures, (c) the importance of establishing the firm’s target audience strategies, and (d) how a company’s vision statement can not only help the shape the future of an organization it can also serve as a motivational tool to help staff members achieve their desired outcomes. Whether you are a business owner or a householder this publication has valuable information for everyone. This eBook will help the reader learn the purpose and importance of developing effective strategic management plans. Mayr explains how strategic planning in organizational management can help determine a company’s future, help strategists detect possible threats and weaknesses, as well as help identify strengths and opportunities. By including a case study of the music industry based on her perceptions and experience as an alumnus of Capitol-EMI Records, this eBook will also help the reader understand more clearly that by including such tactics as the observation and evaluation of organizational behavior and outcomes, strategic management planning can help companies maintain a competitive edge as a leader in the marketplace and still remain profitable. This eBook will help the reader comprehend the significance of conducting an external analysis to assist in the development of efficient strategic plans for organizational management. In addition, it explains how conducting an external analysis can help strategists detect possible threats and obstacles, as well as help them to identify opportunities they may wish to explore. By including a case study of the Best Buy Corporation, this title will also help readers understand how an external analysis aided managers at the firm to navigate through obstacles they faced like globalization, inflation, technological advances, supply and demand issues, political-legal ramifications and social-cultural changes. Plus, these strategies were instrumental for increasing awareness on how their organization relates to the rest of society which in turn, also helped them become more socially responsive. ← One more day to Octoberfirst!